Hi again. I’m David Handel, MD. I practiced medical imaging for over 30 years using tools like CT scans, MRIs and PET scans to study the brain. I retired from radiology last year and now I’m the cofounder of iDoRecall.com. Welcome back to the big finale of our three-part series where we’re reviewing the current status of neuroscience and the latest research about how our brain learns, creates memories and is capable of retrieving those memories. Part I of this series covered the fundamentals of neuroscience relevant to the subject of how our brain learns and creates memories. Part II grounded you in some basic cognitive neuroscience principles. This third and final part of the series will take a deep dive into amazing and very recent discoveries about the molecular and cellular basis of learning and memory. Previously, we learned how the hippocampus is the initial recorder of new memories. We also learned that the amygdala, another important component of the limbic system, is directly wired to the hippocampus. The amygdala is is the center of our emotions related to anxiety, fear, anger and rage. It turns out that emotions play a major role in our memory system. They make sure that we record and store life-threatening events so that we learn important lessons which can save us in the future. Emotions, like anxiety, can also dial down our ability to record new memories and can make it very difficult for us to recall things we’ve learned when really need them, such as during that final exam in economics. How are memories created on a cellular level? What is the underlying molecular chemistry that enables our amazing brains to pull off these feats of learning, memory and recall? I’m sure that you’ve heard the term neuroplasticity, but what exactly does it mean and how does that play out at a microscopic level in our brain? Neuroplasticity is a term that encompasses the brain’s continuous ability to adapt and undergo physical changes on a microscopic level as a result of being exposed to new experiences, learning new ideas, recalling pre-existing memories, experiencing emotions, being exposed to changes in our environment and even suffering damage and injury to the brain. Neuroplasticity is a global concept which takes into account both synaptic plasticity and other non-synaptic ways that our brain tissue physically adapts and changes as it learns and creates memories. For many years, it was believed that the brain was static and unchangeable in adults. 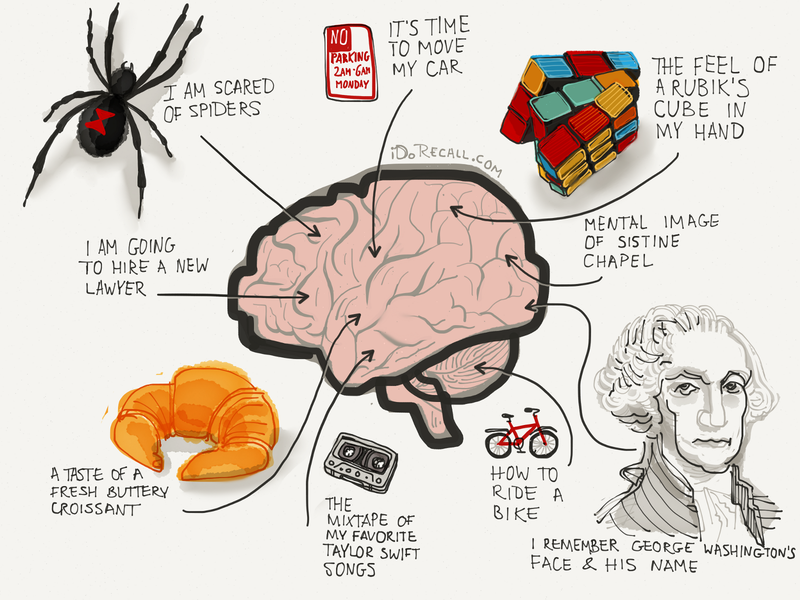 Now we know that the brain is in a continuous state of physical change and adaptation. For a long time it also was believed that once we’re adults, we continually lose neurons but never develop new ones. We now know that, at least in the hippocampus, we can and do continuously develop new neurons throughout life. Just like the hard disk or RAM in a computer is capable of making a recording by storing information using some basic physical principles, it is only logical that our brain must have some physical method for storing a memory. For years we’ve suspected that the site of this data storage was in the synapses in our brain. Today, we have abundant proof that is indeed the case. This ability to record our memories and experiences at the level of our synapses is called synaptic plasticity and this is at the core of how we learn and remember. You will recall that synapses represent the communications interfaces between neurons. As we previously mentioned, we have approximately a quadrillion synapses in our brain, enough to store, by one estimate, a 300 year long HD YouTube video. Figure 1. 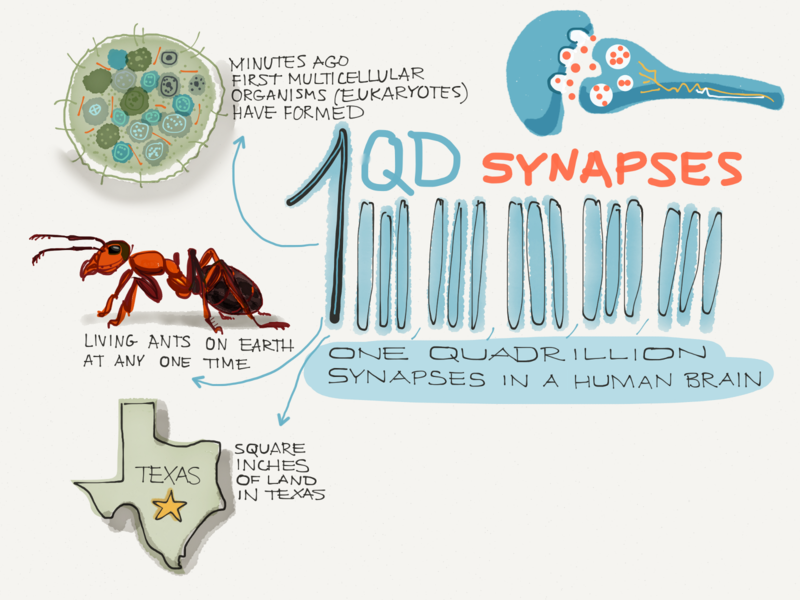 We have an estimated one quadrillion synapses. How big is one quadrillion? Figure 2. 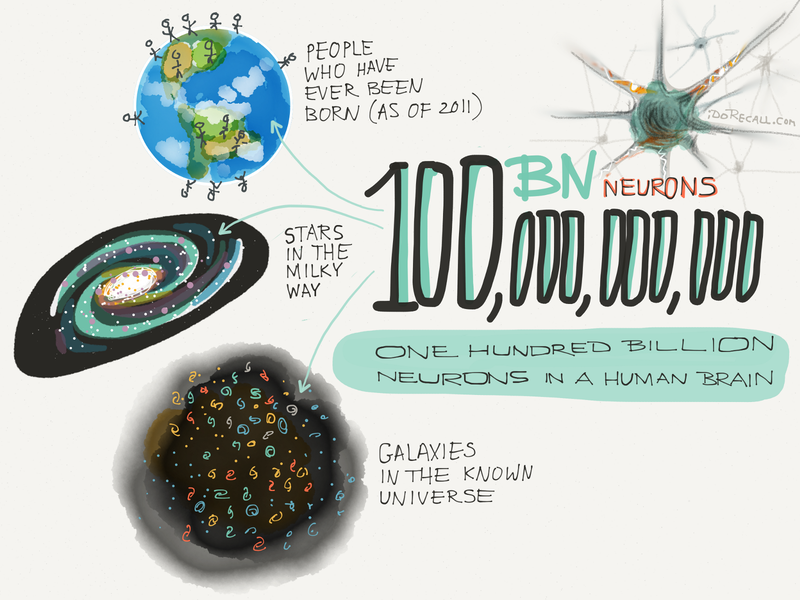 Besides 100+ billion neurons in our brain, what other things are 100 billion? So what exactly is synaptic plasticity on a cellular level? Simply put, our synapses are continuously being altered by our experiences, such as new learning, emotions, recall of existing memories, and a host of other changes in our internal mind and external to our mind. Our synapses can grow bigger, get smaller, get more or less powerful, get pruned, or we can even sprout new ones! What’s that all about? Actually the answer is quite simple and elegant. In order for us to remember and learn, we alter our synapses, making them more or less excitable and more or less numerous. This enables us to record and remember our memories, knowledge, skills, and external and internal worlds. Despite the importance of synaptic plasticity in storing memories, an individual synapse is not capable, on its own, of storing a memory. 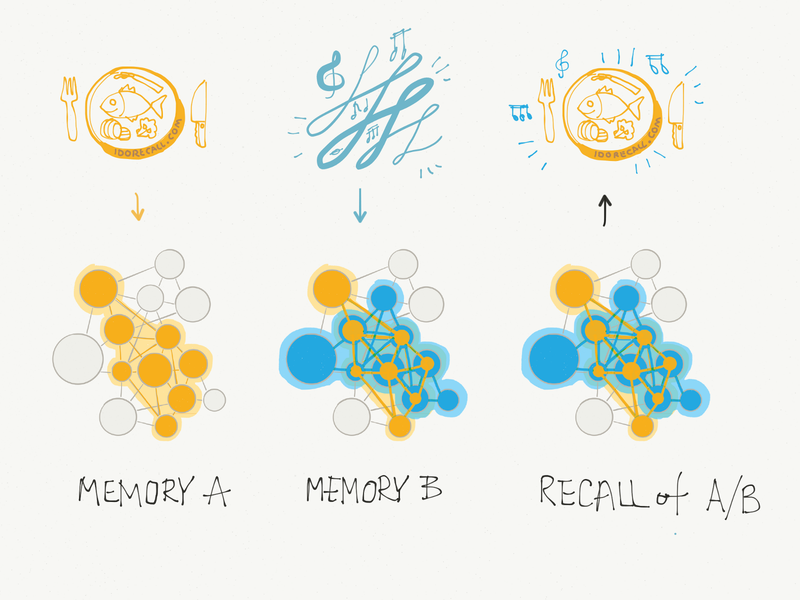 The story of memory doesn’t end at the synapse. Memories have been demonstrated in the laboratory to be stored in localized neuronal circuits whose synaptic interconnections have been created and strengthened, on-the-fly, within minutes to hours, as learning occurs. The small populations of neurons comprising these circuits, which together store a memory, have been conceptually termed an engram by some neuroscientists. (See Figure 3) This lifelong rewiring and stabilization of synapses of engram neuronal circuits is the cellular basis of how our brain encodes and stores a memory. The engram neuronal circuits further reveal the potential to link the association of related and even seemingly unrelated memories. Say for instance you walk into a restaurant that you’ve never visited before. In your hippocampus, your memory for places and 3D imagery becomes activated. Specific neurons and neuronal circuits become recruited. A specialized gene controlling protein (CREB), discussed in greater detail below, is released, “turning on” and enhancing the excitability of those neurons and their circuits of interconnected neighboring neurons. You have a conversation with a waiter and learn something novel. Since you already have activated, freshly “turned on” neurons in your hippocampus, those activated neurons remain excitable for a time. Some of them are very likely to participate in the neuronal circuit recruited to record the novel portions of the conversation that you just had with the waiter. Now the memory of the restaurant and the memory of the conversation with the waiter share some neurons in common. Bam — they become linked memories. Similarly, something the waiter said might have triggered the recall of a prior long-term memory. That older memory might then get linked with today’s newly recorded memories. This explains the anatomic basis for the associative linking of memories. So, it’s no surprise that we easily remember linked events, such as where we were when someone with a certain physical appearance said something interesting to us. Figure 3. Neural circuits or engrams represent a small population of neurons that are capable of storing a memory. When adjacent engrams have some neurons in common, the memories that they each store can become linked. Here engram A stores a memory related to a fish meal. Engram B stores a memory of some music that was playing during the meal. B shares some neurons in common with A. Thus those memories are linked. When you think of the meal you might then recall the music and vice versa. Now that we understand the cellular basis of memory and linked memories, let’s drill down deeper and explore the molecular basis of memory occurring at neurons and their synapses. On a molecular level, how do we modulate our synapses from moment-to-moment? In order to create memories, we need to change the power of individual synapses and the overall synaptic weight, which represents the sum-total synaptic effects on the receiving neuron. Synaptic weight is determined by many considerations including the number of synapses on the receiving neuron, the amount, type and effects of specific neurotransmitters being released into the individual synapses, and the size of individual synapses and the number of receptors that can bind neurotransmitters on the recipient’s cell membrane at each synapse. It has been said that neurons are like teenagers, “…they listen if you repeatedly tell them the same thing, but most of the time they don’t listen.” And so, the synaptic weight represents the total effects of screaming at your teenage neuron until they decide to listen (or not). According to Alcino Silva, PhD., principal investigator of the Silvalab at UCLA, we have identified and manipulated hundreds of genes in the lab and in the process we’ve identified hundreds of proteins involved in regulation of cell-to-cell communication at our synapses that trigger the key changes involved in learning and memory. Among the many important discoveries of molecules that regulate the excitability of our synapses and neurons, the king of the hill is CREB (c-APM response-element binding protein). CREB is a protein whose role is to turn certain genes on and off (regulation of gene expression), and in doing so, regulate the production of proteins that affect synapses. When CREB is turned on, a host of specialized proteins get manufactured. CREB-related proteins make neurons more excitable and turn them into “long-term memory mode”. CREB makes neurons fire their signals more easily and it makes neurons more receptive to excitation. Thus, memory formation can be viewed from the perspective of regulation of gene expression, which in turn controls the synthesis of specific proteins related to synapses. These proteins alter the excitability of synapses and contribute to the overall excitability of postsynaptic receiving neurons. In summary, this is the cascade of events — manipulation of gene expression, leading to manufacture of certain proteins, which then alter synaptic morphology (the number of receptors on the dendritic side of the synapse), and ultimately alter the excitability of the receiving neuron. This process determines which neurons and neuronal circuits will be recruited to store a given memory. I mentioned a moment ago that the proteins released as a part of the process which increases the excitability of the synapse also alter the morphology of the synapse. What do I mean by that? What’s that all about? We need to look at the anatomy of synapses a little closer than we have thus far. Synapses are the interfaces between neurons and exist so that one neuron can communicate with and influence another. Previously we described how most synapses occur between an axon or axon terminal of one neuron interfacing with the dendrite or cell body of another neuron. Let’s dig deeper. Perhaps the most common type of synapse is an interface between an axon that happened to pass close by the dendrite of another neuron, so called en passant. In response, that dendrite developed a protrusion called a dendritic spine, which met with a localized swelling of the axon called a presynaptic bouton. (See Figure 4,5) Voila, the interface or synapse is created. Figure 4. The morphology of dendritic spines is conceptually depicted above. Various spine morphologies have differing power to control the excitability of the receiving dendrite. Figure 5. Demonstration of the synaptic (postsynaptic) spine and the passing-by axon with its presynaptic bouton. New synapses can spontaneously arise within minutes to hours. Neurotransmitters are released by the bouton as a result of an electrical wave traveling down the axon. These chemicals diffuse across the narrow space and attach to receptors on the membrane of the spine. This results in the increase or decrease of the electrical excitability of the spine. 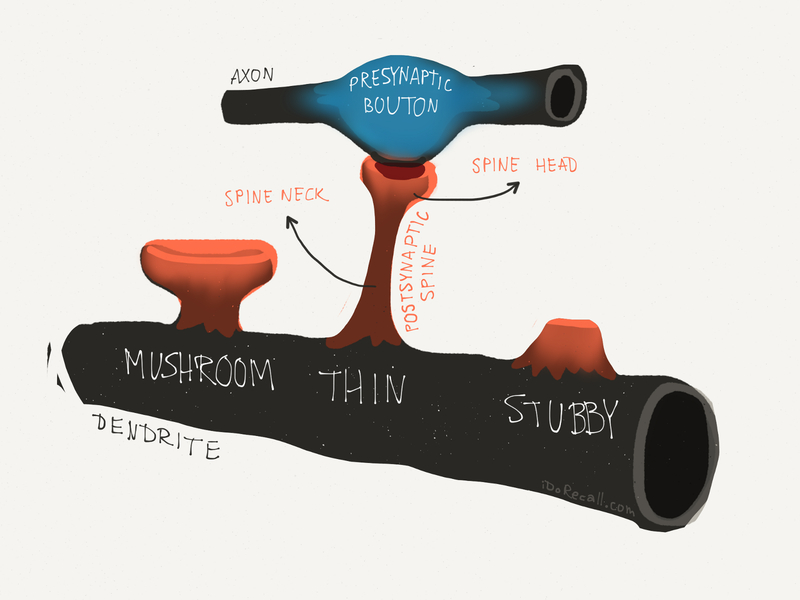 The spines come in various shapes and sizes which we call their morphology. Figure 6. For decades it was believed that individual memories were stored diffusely in the cerebral hemispheres. Now we know that each memory is stored at its own small locus. The key to recall is finding the path back to the memory.